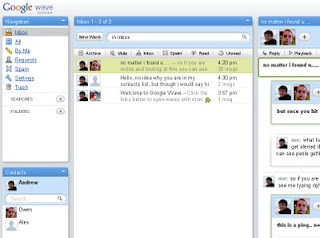 Just checking out the features of Google Wave, its in its early days. But plenty of things to try out. Some neat display options for the folders/contacts list etc. However, at the moment there appears to be a huge burden on the user as to the 'correct way' to use a wave so that its not confusing for the other users. You can ping people (to add them into a wave at a certain point), reply in private, reply at any stage of a wave, edit someone else text in a wave! I though they wanted to get anyway from confusing monster email's.. Even with the playback, playing back a 60 reply message is not so quick.. Thanks to Owen for getting me the invite! Check out the his web comic.